Note: This letter was rejected by the Medical Journal of Australia on 12th August 2003. In a recent study1 published in the Journal prisoners were offered antiretroviral drugs on the basis that a positive antibody test is proof for transmission of an AIDS causing retrovirus HIV. Although this represents the majority view, the evidence in its favour is not without problems.2-5 Antibodies are polyspecific and are apt to yield confounding cross-reactivities.6, 7 These are particularly likely in AIDS patients for several reasons including their typical hypergammaglobulinaemia and the fact that 90% of AIDS diagnoses involve fungal or mycobacterial agents8 which induce antibodies reactive with the antigens employed in the antibody test kits.9-12. Proof that the antigens in the test kits react exclusively with antibodies directed against a retrovirus HIV can be obtained only by comparing the reactions with HIV itself. That is, HIV isolation is the only scientifically valid gold standard for determining the specificity of a test claimed to diagnose HIV infection. Yet to date there are no such data, a caveat repeatedly included in the packet insert of one test manufacturer: “At present, there is no recognized standard for establishing the presence or absence of antibodies to HIV-1 and HIV-2 in human blood”.13 Instead of using the correct gold standard HIV experts and biotechnology companies determine specificity for HIV using AIDS as a gold standard. Not only is this not the professed outcome of the test,14 if AIDS is used as a gold standard then by definition, all seropositive, AIDS-free individuals including gay men, drugs users, haemophiliacs, Africans and those not in a defined risk group, healthy or otherwise, must be false positives. Given the majority of seropositive individuals fall into these categories, no such individuals can be infected with HIV, the positive predictive value of the tests is insignificant and “the global burden of HIV” unsubstantiated. Within the risk groups a positive antibody test, whatever its genesis, correlates with the presence or development of the clinical AID syndrome. This relationship is not under contention. What the minority view disputes is the claim that data based on an AIDS gold standard prove the tests specific for a retroviral infection. In no way does this view preclude the tests possessing a high degree of clinical relevance. Physicians are familiar with several non-specific laboratory tests of diagnostic and prognostic utility. For example, an elevated erythrocyte sedimentation rate (ESR) is caused by "the dielectric effect of proteins in the surrounding plasma", especially "fibrinogen, immunoglobulins, and other acute-phase reaction proteins", and their increased levels in some disease states.17 Values exceeding 100 mm/hr have a 90% positive predictive value for serious underlying pathology including infection, collagen vascular disease or metastatic tumours.18 Thus, like a positive antibody test, an elevated ESR also predicts a number of unrelated diseases including AIDS indicator diseases19 and encompasses an increased probability of dying within the next several years. These matters have significant implications now that the November 1992 Australian High Court ruling on Rogers-v-Whittaker obliges physicians to provide patients with “all the relevant information to choose between undergoing and not undergoing the treatment”.20 The same principle is echoed in the AMA Code of Ethics, “Make sure that all research participants or their agents are fully informed”,21 and in the Helsinki Declaration, “In any medical study, every patient – including those of a control group, if any –should be assured of the best proven diagnostic and therapeutic method”.22 Prisoners are no exception to the need for informed consent with treatments based on the interpretation of a laboratory test. In fact they present an extra ethical dimension because they are held in captivity and, rightly or wrongly, may feel coerced into accepting treatments which are potentially toxic. Neither is the issue of providing full, relevant information a legal obligation only for prisoners. There may be other individuals reluctant to question their physicians’ good intentions or who feel unable to deal with a doctor who lacks awareness of other scientific opinion. This places patients at risk of passively accepting treatments they might otherwise defer or reject. Physicians and researchers offering treatments should acquaint their patients with the scientific basis of the tests they use including scientific opinion at variance with their own. 1. O'Sullivan BG, Levy MH, Dolan KA, Post JJ, Barton SG, Dwyer DE, et al. Hepatitis C transmission and HIV post-exposure prophylaxis after needle- and syringe-sharing in Australian prisons. Med J Aust 2003;178:546-9. 2. Papadopulos-Eleopulos E, Turner VF, Papadimitriou JM. Is a positive Western blot proof of HIV infection? Bio/Technology 1993;11:696-707. 3. Papadopulos-Eleopulos E, Turner VF, Papadimitriou JM, Causer D. HIV antibodies: Further questions and a plea for clarification. Curr Med Res Opinion 1997;13:627-634. 4. Papadopulos-Eleopulos E, Turner VF, Papadimitriou JM, Causer D, Page B. HIV antibody tests and viral load - more unanswered questions and a further plea for clarification. Curr Med Res Opinion 1998;14:185-186. 6. Nossal GJV. Antibodies and Immunity. Harmondsworth, UK: Penguin Books Ltd; 1971. 7. Ternynck T, Avrameas S. Murine natural monoclonal antibodies: a study of their polyspecificities and their affinities. Immunol Rev 1986;94:99-112. 8. Hu DJ, Fleming PL, Castro KG, Jones JL, Bush TJ, Hanson D, et al. How important is race/ethnicity as an indicator of risk for specific AIDS-defining conditions? J Acquir Immune Defic Syndr Hum Retrovirol 1995;10:374-380. 9. Muller WEG, Bachmann M, Weiler BE, Schroder HC, Uhlenbruck GU, Shinoda T, et al. Antibodies against defined carbohydrate structures of Candida albicans protect H9 cells against infection with human immunodeficiency virus-1 in vitro. J Acquir Immun Defic Syndr 1991;4:694-703. 10. Matthews R, Smith D, Midgley J, Burnie J, Clark I, Connolly M, et al. Candida and AIDS: Evidence for protective antibody. Lancet 1988;ii:263-266. 11. Kashala O, Marlink R, Ilunga M, Diese M, Gormus B, Xu K, et al. Infection with human immunodeficiency virus type 1 (HIV-1) and human T cell lymphotropic viruses among leprosy patients and contacts: correlation between HIV-1 cross-reactivity and antibodies to lipoarabinomannan. J Infect Dis 1994;169:296-304. 12. Tessema TA, Bjune G, Hamasur B, Svenson S, Syre H, Bjorvatn B. Circulating antibodies to lipoarabinomannan in relation to sputum microscopy, clinical features and urinary anti-lipoarabinomannan detection in pulmonary tuberculosis. Scand J Infect Dis 2002;34(2):97-103. 13. Packet Insert Axsym system (HIV-1/HIV-2). Abbott LaboratoriesDiagnostics Division. 100 Abbott Park Rd. Abbott Park. Illinois: United States of America. 1988, 1998. 14. Griner PF, Mayewski RJ, Mushlin AI. Selection and interpretation of diagnostic tests and procedures. Ann Int Med 1981;94:559-563. 15. Genelabs Diagnostics Pty Ltd HIV BLOT 2.2 Instruction Manual. Singapore; 1999. 17. Wintrobe WM, Richard Lee G, Boggs DR, Bithell TC, Foerster J, Athens JW, et al. Clinical Hematology. 8th ed. Philadelphia: Lea & Febiger; 1981. 18. Brigden M. The erythrocyte sedimentation rate. Still a helpful test when used judiciously. Postgrad Med 1998;103:257-62, 272-4. 19. Papadopulos-Eleopulos E, Turner VF, Papadimitriou JM, Alfonso H, Page BAP, Causer D, et al. High rates of HIV seropositivity in Africa-alternative explanation. Int J STD AIDS 2003;14:426-427. 20. Rogers v. Whitaker (1992) 175 CLR 479 F.C. 92/045. The High Court of Australia; 1992. 1. WHO. (1990). Acquired Immunodeficiency Syndrome (AIDS). Proposed criteria for interpreting results from Western blot assays for HIV-1, HIV-2 and HTLV-I/HTLV-II. Weekly Epidemiological Record 65:281-298. 2. Healy DS, Maskill WJ, Howard TS, et al. (1992). HIV-1 Western blot: development and assessment of testing to resolve indeterminate reactivity. AIDS 6:629-633. 3. Lundberg GD. (1988). 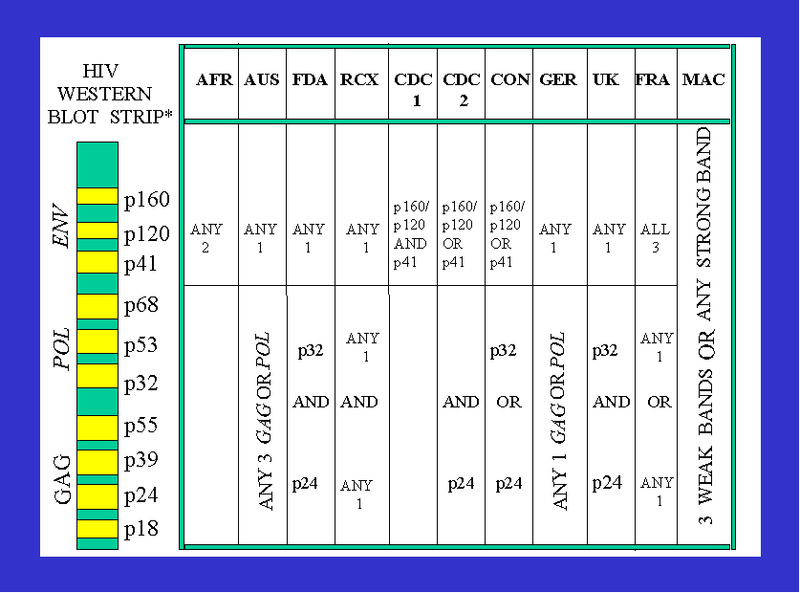 Serological Diagnosis of Human Immunodeficiency Virus Infection by Western blot Testing. Journal of the American Medical Association 260:674-679. (Data presented in this paper reveal that when the FDA criteria are used to interpret the HIV Western blot less than 50% of US AIDS patients are HIV positive whereas 10% of persons not at risk of AIDS are also positive). 4. Mylonakis E, Paliou M, Greenbough TC, Flaningan TP, Letvin NL, Rich JD. Report of a false-positive HIV test result and the potential use of additional tests in establishing HIV serostatus. Archives of Internal Medicine 2000;160:2386-8. 5. Keinman S, Busch MP, Hall L, et al. (1998). False-positive HIV-1 test results in a low -risk screening setting of voluntary blood donation. Journal of the American Medical Association 280:1080-1083.